Are you seeking a summer job experience that builds your resume, your professional experience and your bank account – and is both meaningful and fun? Do you enjoy the outdoors, kids, and making friends from around the world, and making a difference? A summer camp job offers all of this, and the chance to experience a new part of the country, too! Talisman Summer Camp offers you many opportunities for personal and professional growth, and we provide you with some of the best training in the industry. We work specifically with kids who have high-functioning autism, ADHD or similar social skill needs. Whether you are considering a career in education, outdoor leadership or psychology, or just want to build leadership and mentoring skills, you will come away with invaluable work experience and a solid understanding of this unique population. You will also know you have positively changed the life of more than one child. Becoming a leader starts with staff training at Talisman Camps. This is a fully immersive environment where you will have 2 ½ weeks of training not just in working with special needs youth but also in Wilderness First Aid, camping skills, conflict resolution, group problem-solving and the start of a diverse tool box to help you be successful in any number of working environments. Along with co-counselors, you will help a group of campers navigate challenges, try new activities, make friends, and grow as a team through fun and engaging experiences. 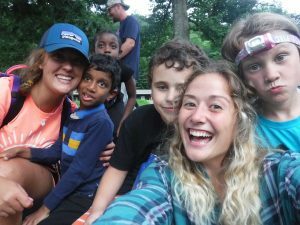 Summer camp is a great bonding environment for both campers and staff. In the midst of all that camp activity, you will build strong friendships with co-workers from around the world. Every summer we have staff from the USA, UK, and Australia. It is a great chance to create lasting bonds that lead to visiting friends abroad, understanding new cultures, and professional networks that will last decades after camp ends. What a great chance to play outside and get paid for it! 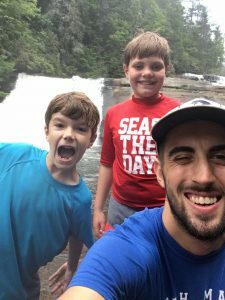 As you spend the summer in the sun kayaking, hiking, camping, and backpacking you will gain both hard and soft skills and make lasting memories. You will enjoy the beautiful North Carolina landscape and have a chance to save money as you go! Since room, board and activities are all covered by camp, you can save money all summer. Many of our staff also earn college credit via internships set up in advance and carried out at camp. To learn more about how you can join us this summer contact us today!